In industrial processes, polymer melts are often exposed to a combination of fast cooling rates, high flow fields, and high pressures. The processing conditions have an ultimate impact on the structure that develops during cooling. The final structure at the nano- and microscopic level determines the properties of the final polymer product. Small and wide angle X-ray scattering and diffraction (SAXS/WAXD) are the best techniques for investigating in-situ and real-time fast polymer structuring at a scale ranging from 0.1 to 100 nm. 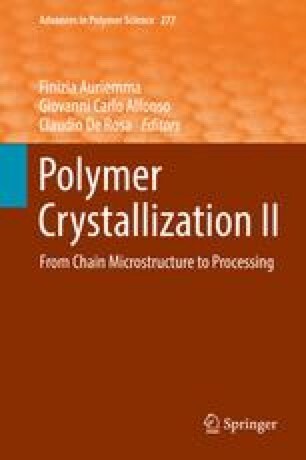 This contribution reviews the main quantities that can be extracted from SAXS and WAXD experiments on semicrystalline polymers and shows the most recent results on real-time investigation of polymer structuring with millisecond time resolution. Examples of structuring during fast cooling, flow in confined geometry, and uniaxial stretching are discussed. Future directions for the use of synchrotron SAXS/WAXD to study fast polymer structuring are also discussed.